If you have more than 1 week to go on holiday then take a look at our Honeymoon package 10 days 9 nights Phuket no.1 We have a few different combinations of these packages and you can see them list below. There is a lot of free time in this itinerary, so you can relax, go to the beaches, go shopping , get massages and have some fun and check out Phuket night life. If you want to book anything extra that might not be included in this package, just talk to us and we can make any changes/ additions that you want and re-price this package for you. Day 1 we collect you from the airport and take you to your hotel to check in, the rest of that day and all of Day 2, you have free time to relax. Day 3 is an early start and we pick you up and take you for your one day trip to Phi Phi, Maya & Khai islands by speed boat. Day 4 is an amazing day out on a luxury catamaran, island hopping, eating and drinking, it is like a day club on a boat, really great day. Day 5 relax during the day and then we come to pick you up late afternoon and go to the famous Phuket Fantasea show & dinner. Day 6 is your zipline adventure tour. 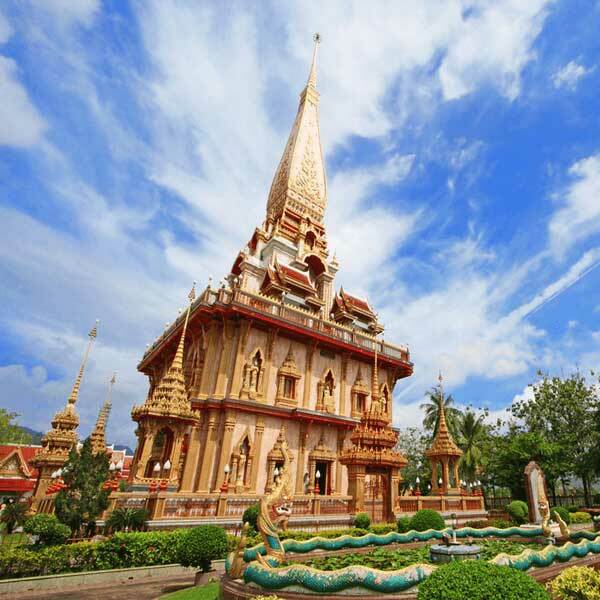 Day 7 we have a 5 hour private city tour of Phuket for you. Days 8 & 9 are free time for you, but if you want to do any more activities please talk to us and we can book them for you. Day 10 it is check out of your hotel then on to the airport to take your flight. Bye bye Phuket. One Day Trip Phi Phi Maya & Khai Island Premium Service by Speedboat. 07.30-08.00 We will pick you up from your hotel and take you to the “Royal Phuket Marina”. 09.30 Leave from the marina and go to “Phi Phi Island”. 09.50 Enjoy snorkelling at the lovely white sand beach at “Yong Kasem” (Monkey Beach) and explore the many delights at “Camel Rock” (Nui Bay) and it’s beautiful scenery. 10.30 Arrive at “Phi Phi Lay” and get to know the unique landscape of “Maya Bay” (Made famous from the movie “The Beach”) Its up to you to try snorkeling the beautiful reefs or simply relaxing on the beach with a cool drink. Discover the hidden delights “Loh Samah Bay” and “Pileh Lagoon” and “Viking Cave”. 12.30 Enjoy a sumptuous lunch at a beachside restaurant at the hotel on “Phi Phi Don”. After lunch spend your time relaxing on the beach or engage in sea sport activities. 14.00 Depart from Phi Phi Don to “Khai Nai Island”. 15.00 Relaxing on a white sandy beach or swimming and snorkelling the clear waters at Khai Nai Island. 16.00 Leave from Khai Island to “Royal Phuket Marina”. Hype Luxury Boat Club by Catamaran. 10.00-10.30 Be ready for the pick up of Hype Luxury Boat Club. Enjoy music DJ and dance and swimming. Free Day – Evening Phuket Fantasea Show + Dinner. 17.00 Pick up from your hotel and take you to Phuket Fantasea. 18.00 Arrive at “Phuket Fantasea” and Enjoy Dinner Buffet. 23.00 Arrive back to your hotel. Adventure Flying Hanuman (*Program A) + Meal. – Start play zip line, Program A (28 platforms, 15 zip lines, 2 abseil points, 2 sky bridges, 3 spiral staircases, 1 sky rail, 20 min wilderness walk) Highlights (Phuket Town view point, Sky rail, Honeymoon sling, 40 m abseil point, 400 m longest zip line, 2 hrs zip line eco-adventure). Phuket City Tour 5 hour By Private Car. – Our staff will waiting you at hotel lobby and start to explore drive to take you to look around. *For this private city tour you also can talk to us about going to different places than what we have listed below. – Arrive back to your hotel.